Give them not only foods but home. I criticize for feeding stray cats. However the person who could give a home to a homeless cat easily than anyone else is who has been feeding, actually. In fact, stray cats depend on humans who feed them. Unfortunately, it often makes another person difficult to close a stray cat. One of the bad effects of feeding stray cats is making a situation that keeps true cat lovers apart from the cat. It is not less people who think that house cat means being sold in a pet store with a pedigree paper and stray cat means no worth to sell. They assume a house cat and a stray cat are different species. My explanation, “A cat is a cat. People call a cat in different words such as a house cat, a stray cat, a community cat, but they are all the same species,” would be slightly laughed. My conversations with people who feed stray cats give me an insight. Currently, I think reducing the people who feed stray cats is the first step to help to reduce homeless cats and their tragedies. They are almost middle-aged or elderly. If the next generation doesn't feed stray cats in outdoors thoughtlessly and welcome a stray cat as their family member, miserable stray cats will be less and less. Regarding a cat as a family might be laughed and be criticized as anthropomorphism. But I think that if we humans have no sense of anthropomorphism we have no love for everything. Idea of which one person rescues one cat. 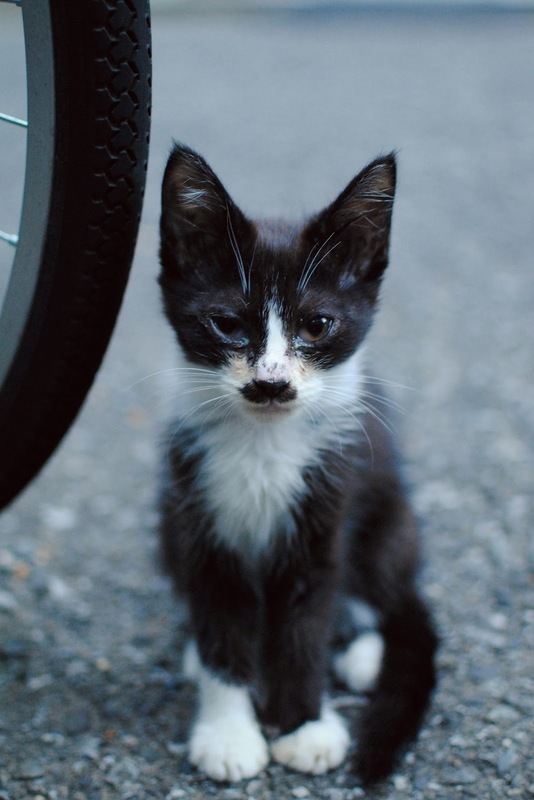 We ordinary people tend to leave issues of stray cats to an activist group such as an NPO. I also have asked to rescue stray cats three times for three activist groups in the past. But all of them rejected before I tell the details. However, if you think of it carefully, you will notice it's a wrong idea to expect that an activist group could rescue stray cats without restriction. And it might be a better idea that one person rescues one cat rather than one activist group rescues 100 cats. So we ordinary people should do what we can do. I don't recommend to rescue multiple stray cats at a time. Keeping multiple cats could be a more serious problem for cats when the keeper become poor or sick, and when he or she dies. The ideal activity which I think of is one person rescues one cat. If this idea and activities spread widely, stray cats would reduce. There are so many stray cats in outdoors, but it's obviously less than humans. Then we, people of Tokyo, come up against an obstacle that 90 percent of apartments in Tokyo prohibit to keep a pet. I don't think it is right to ignore bad rules. Though I broke the rule twice for rescue fragile lives, a kitten and a sick old cat, I currently have moved to an apartment which one of 10 percent. The tendency of our society should be shifted. It is not less people who tell the reason why they can't keep or rescue a stray cat. I eager to let landlords and management companies know that acceptance of keeping a pet means to save a life. Increasing of stray cats caused by media. The media, mainly publishers, in Japan often introduce stray cats as free, funny, cute animals living in outdoors. When publishers feature about stray cats in a magazine, they write a title of the article like: ‘Happy cat town of Tokyo’, ‘Paradise island of cats’, ‘Joyous encounter with alley cats.’ And a lot of photo books distribute so many happy looking images of stray cats to people. 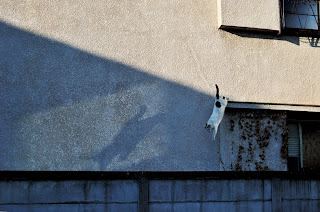 One day, I went to a cat photo exhibition, the photo of the poster and the flyer was a jumping cat. The photo is apparently amazing. The cat's tail is held vertically, the background is the blue sky. But I couldn't help but feel different in the face. The eyes aren't animated. I doubted if the cat really had jumped pleasantly. However, people smiled at the sketchy impression. Hanging around to expect to encounter stray cats in a town and meeting a cat who looks happy, and taking their photos, sharing the photos on the internet with cat lovers are wonderful. But I gradually became to feel it's hard. Because there are definitely so many pitiful stray cats than happy stray cats. When I take 10 stray cat photos, for example, 7 miserable cats will be hidden in my storage and 3 happy-looking cats will be in publish makes me feel that I am betraying stray cats totally. I began to think I should take photos which represent stray cats. I had been taking stray cat photos for 6 years and one conclusion came out. It was unexpected even for me. It is all cats shouldn't be in outdoors. Every cat is a creature who should be relaxed in a human's house. I learned this truth from an sick old cat who was rescued by me. Some of the people who feed stray cats, or wild birds, are trying to make an ideal circumstance of human and animal coexistence. But this is a wrong idea. Cities are consisted in the exclusive way for animals. Asphalt and concrete don't resolve animal excrement. Cats are non-wildlife who have been selected and evolved by human beings. So its brain keeps itself being infant even when the body grows up an adult. The fact of stray cats is just infants who are living in the outdoors. The municipal governments of Japan must have been culling tens of thousands stray cats every year for more than four decades. The fact exists behind the tendency of uncritical admiration of stray cats from far away. The media still contribute making such tendency. 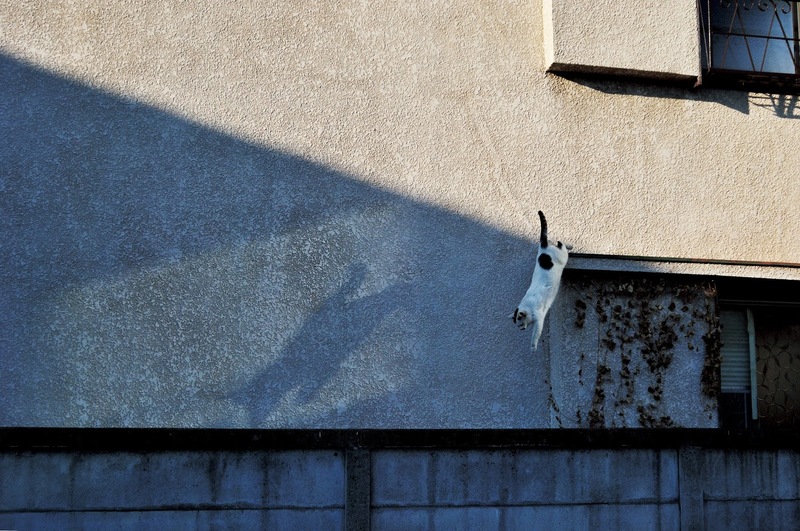 *I post this image of a stray cat leaping downward, as a metaphor of their lives. Stray kittens having distrust of humans. Infant stray cats born in an alley become distrustful of humans so quickly. Their mothers are given foods by humans, but most of people who feed stray cats are not supposed to touch stray cats. 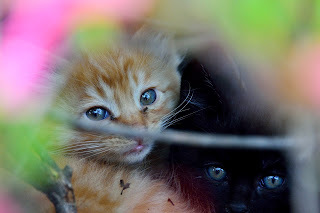 Stray kittens who see that sight grow without expectations of human love. A lot of people who feed stray cats scatter the foods on the asphalt as though they are pigeons. The fact, which make the issue complicated, is they haven't kept a cat ever. They don't see a cat like their baby. After scattering foods and gathering stray cats, they will be satisfied and leave hurriedly. They don't make certain if some cats have health problems or the others who don't come over to eat. They also don't pick up leftovers, so it becomes rotten on the asphalt and makes the neighbor provoked. We tend to assume that a cat lover is humane and a cat hater is inhumane. A person who feeds stray cats looks kind and a person who pastes up a notice which says don't feed stray cats looks cold- blooded. But this is a prejudice. People who don't like stray cats actually hate just the unhygienic environment and a foul smell in many cases. Cats almost don't have any body odor. Not a few people think smell of cat excretas is cat smell. This is a fault of whom feeding stray cats. They only give foods in passing by and force the neighbors to clean the excretas up. Unfortunately, anger of neighbors who live around the feeding place often targets stray cats, not humans. They make a loud sound with foot pounding or hitting something to drive the stray cats away. 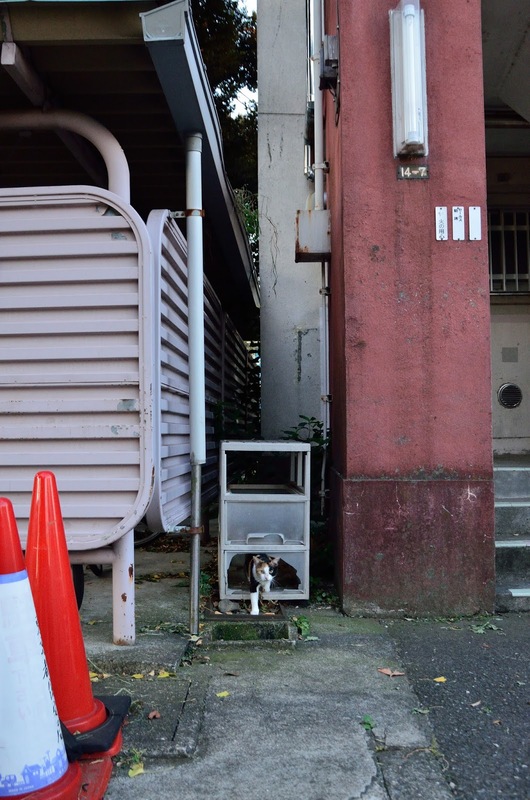 Recently, you can see an equipment of ultrasonic deterrent where stray cats live in. Through these experiences, infant stray cats become distrustful of humans more and more. And it becomes harder to rescue them. Some of infant stray cats show curiosity a bit for a person who try to reach them, but never across the boundary where the hands catch them. Most of them would die before they grow into an adult or would be cought as things of culling by a municipal government. Some of them, who survive fortunately, would come to the end of short life in a solitary without trust of humans. One time, I noticed that distributing happy images of stray cats is not good for cats. It could cause to abandon a house cat. My photographs and articles here are the truth of stray cats of Tokyo. Using copies of photos and articles: I agree as long as the purpose is to spread the activity of which to pick a stray cat up from the outdoors and keep it in the house. Written and photographed by Naoto Shinkai. I’m looking for a volunteer editor for my English article to correct grammar and suggest better expression. Instead, I could help you if you want to write an article in Japanese language. Please email me at aclownintears@gmail.com. Thank you.